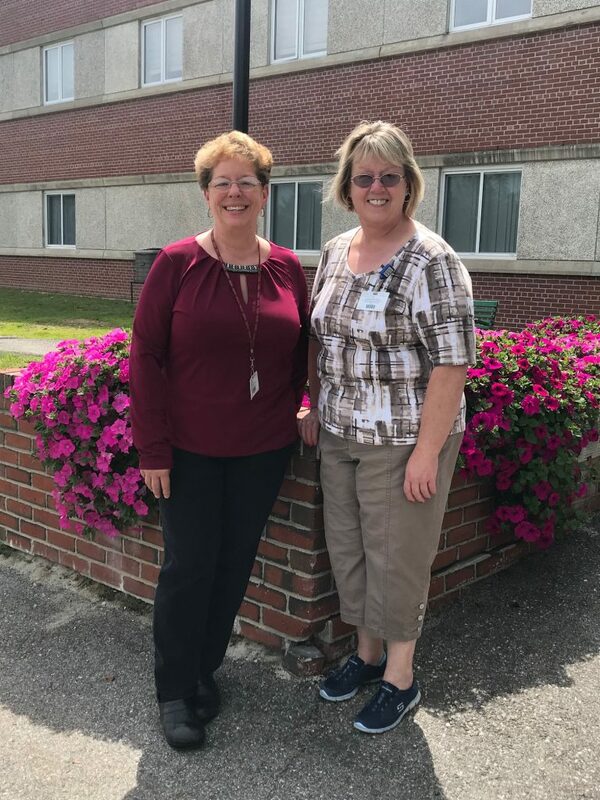 MILLINOCKET – MRH’s Employee/ Family Picnic and the 35th Annual Employee Service Awards Ceremony were held Thursday September 13th. With perfect weather in plentiful supply, employees relaxed under a huge tent and were treated to a bountiful picnic buffet that featured grilled chicken and hamburgers as well as assorted salads. For dessert, five different kinds of the iconic Maine whoopie pie were offered. After the picnic, attendees moved inside to the hospital’s multi-purpose room where the awards ceremony was held. Twenty three employees honored had a combined total of 320 years of service to MRH. Managers paid tribute to the recipients by sharing their accomplishments at the hospital and in their particular departments. Award recipients also were given gold pins with precious gems for varying lengths of times of service. Norma Jowdry in Chapman Laboratory received her 40 year pin; Lee Ann Goddard from Patient Financial Services was honored for 35 years with a pin; and Kim Cox from the Emergency Services department and Deidra Perrow from Wellness got their 30 year pins. Many others received awards and pins as well, and they are listed in a congratulatory announcement in this issue. Materials Management received the 2018 Department of the Year award. They were chosen by the 2017 winners, Diagnostic Imaging who nominated them ” for their willingness to assist with urgent requests, excellent rapport across all departments, wealth of knowledge always shared to the benefit of the patients and staff alike, strong work ethic, and they are also a pleasure to deal with.” MRH’s CEO Bob Peterson had high praise for the employees of the hospital. “This hospital stands out in the care we deliver and the personalized manner in which that care is delivered. We are truly different from other hospitals and that difference has been present throughout our history…. I want to congratulate each and every honoree and thank them for sharing their knowledge with us and carrying on the rich tradition of MRH,” Peterson said.